UEM Sunrise Berhad (“UEM Sunrise”), one of Malaysia’s leading property developers announces that Atkins, a member of the SNC-Lavalin Group, has won the International Land Use Master Planning Competition for Gerbang Nusajaya’s Transit-Oriented Development (“TOD”) plot. Atkins was selected out of other participating world-class master planners, based on its remarkable, practical and sustainable design for the TOD plot that surrounds MyHSR Corporation Sdn Bhd’s (“MyHSR Corp”) Iskandar Puteri High-Speed Rail (“HSR”) station in Gerbang Nusajaya. 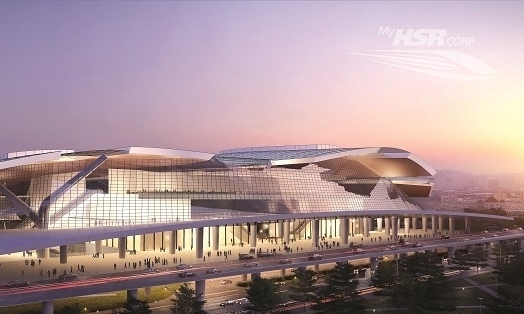 Prime Minister of Malaysia, Dato’ Sri Mohd Najib Tun Abdul Razak, has recently unveiled the architectural concept designs of the seven stations in Malaysia for the Kuala Lumpur-Singapore High Speed Rail (“KL-SG HSR”), namely Bandar Malaysia, Sepang-Putrajaya, Seremban, Melaka, Muar, Batu Pahat and Iskandar Puteri at the MyStations: Transforming Malaysia event. The idea of KL-SG HSR was initiated through the Economic Transformation Programme (“ETP”) to transform Malaysia into a high-income nation. The KL-SG HSR stations will also transform the landscape of the region as towns along the line stand to benefit from the opportunities, facilitated by greater accessibility. Commenting on the competition and the winning master plan design, UEM Sunrise’s Managing Director/Chief Executive Officer, Anwar Syahrin Abdul Ajib said, “With the announcement of Atkins as the winner for the International Land Use Master Planning Competition, UEM Sunrise is now well-positioned to develop and bring to life the Gerbang Nusajaya’s TOD. We will soon commence the detailed planning and submission for the TOD surrounding the Iskandar Puteri HSR station and together with our strategic stakeholders, we hope to unlock the full potential of Gerbang Nusajaya. The connectivity will enable businesses to be more productive and access a broader marketplace, while the public will enjoy an improved travel experience of shorter travel time (90 minutes from Kuala Lumpur to Singapore) and a comfortable ride through the KL-SG HSR’s city centre to city centre connection along the corridor. Gerbang Nusajaya’s TOD will be developed in parallel with the Iskandar Puteri HSR station. UEM Sunrise has committed to completing the TOD in time for the station to receive its first passengers once the KL-SG HSR becomes operational in 2026. The Company is also continuing to explore potential collaborations with partners and stakeholders to jointly develop the TOD area.